Panda Fu Hu eats bamboo at the Schoenbrunn zoo in Vienna, on October 16, 2012. A key attraction ever since his sensational birth there in 2010, Fu Hu—"lucky tiger" in Mandarin—is now two years old, and must return to China under the zoo's contract with Beijing. A key attraction ever since his sensational birth there in 2010, Fu Hu—"lucky tiger" in Mandarin—is now two years old, and must return to China under the zoo's contract with Beijing. But in the wild, this is also the age when a cub bids farewell to its parents. "He has already learnt everything he needs to know from his mother. Now he can learn much more from bears of the same age," Renate Haider, Fu Hu's main caretaker, told AFP. Schoenbrunn scored a huge success in 2007 when it became the first European zoo to see a panda born from natural conception. Given the bears' endangered status and short mating time, zoos usually resort to artificial insemination. The first natural-born panda, Fu Long, was an immediate crowd pleaser but, under the same contractual obligation, had to leave the baroque surroundings of the Vienna zoo at the age of two. Within 12 months came the next sensation when Fu Hu saw the light of day on August 23, 2010, right on his brother's birthday. "They're so adorable, totally fluffy. You'd really just like to cuddle up to him," said teenager Lara Mechler from Muenster, Germany, gazing happily at Fu Hu and his mother on a recent visit. The zoo is proud of its conservation success, which it puts down to good infrastructure and training that helps keep the pandas physically and mentally fit. Renate Haider (L), caretaker at the Schonnbrunn zoo, interacts with panda Fu Hu during daily exercises in its transport cage to adapt to the transport condition and new environment at the Schoenbrunn zoo in Vienna, on October 16, 2012. Schoenbrunn also conducts research in collaboration with its Chinese partners, such as pandas' ability to recognise each other from the black patches around their eyes or the sounds that cubs make. The panda—which appears on the logo of the WWF—"is the symbol for wildlife conservation after all," said zoo director Dagmar Schratter. "Especially with such endangered animals, our ambition and our duty is to try and encourage our animals to mate." Taking care of two adult pandas and a cub is no mean feat. Each bear eats between 20 and 30 kilogrammes (44-66 pounds) per day of bamboo, requiring a delivery of about one tonne every other week—flown in from southern France as the requisite amounts are not available in Austria. Schoenbrunn also insists that its pandas should remain wild and keeps interactions with its caretakers to a minimum. "Pandas are certainly the most jovial, calmest bears as they are not hunters, but they are still bears," said Haider. "We can go in and see the little one as he's just 50 kilogrammes and not as dangerous, but the adults are 100 kilogrammes... even if they just wanted to play, something could go wrong." As Fu Hu prepares to leave for China on November 6, visitors are already mourning his departure. "It's sad, of course, because he is part of Schoenbrunn Zoo. His presence made more and more people come here and visit," said retiree Monika Braun, who holds an annual zoo pass and comes to see the animals regularly. A team from Vienna will accompany Fu Hu to the Bifengxia panda reserve in China's Sichuan province to help ease him into his new surroundings. In the meantime, a travel crate has been installed in his enclosure and Haider regularly draws him inside with treats while colleagues rock the crate to simulate potential in-flight turbulence. "We've been practising the whole procedure so he knows it all and the loading will be as stress-free as possible," said Haider. 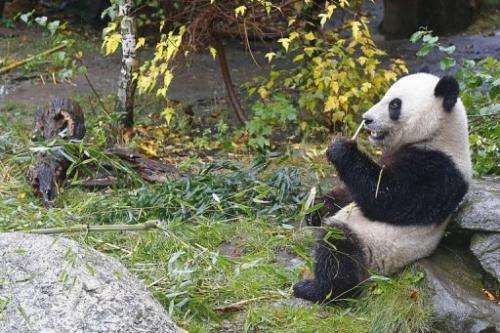 The 10-year loan of Fu Hu's parents Yang Yang and Long Hui, meanwhile, expires in March but the zoo is already in talks to extend the contract for another decade and remains optimistic. Now the question is whether Schoenbrunn will see a third cub next summer. "In the spring it is mating time again and the adults get along very well so I think nothing should get in the way," said Haider. "Let's see what happens!"